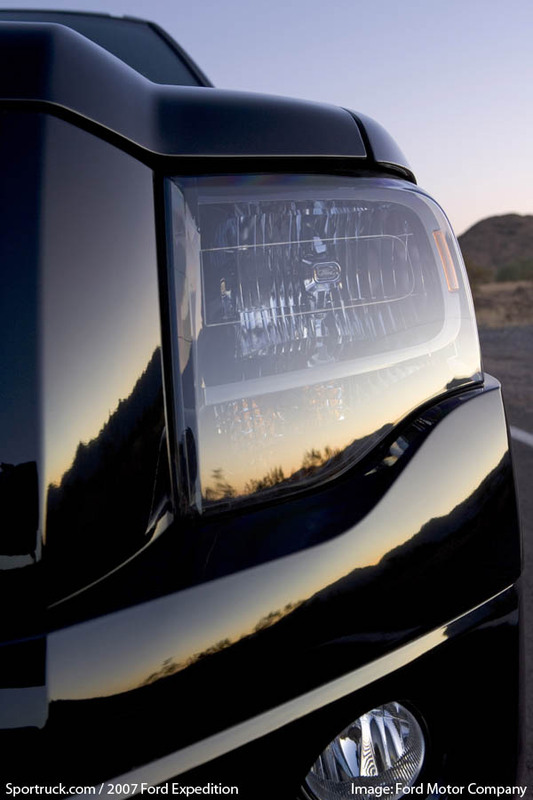 New dual-beam headlamps feature the Ford-themed step-up design with the integrated side-marker lights wrapping around into the front fenders. 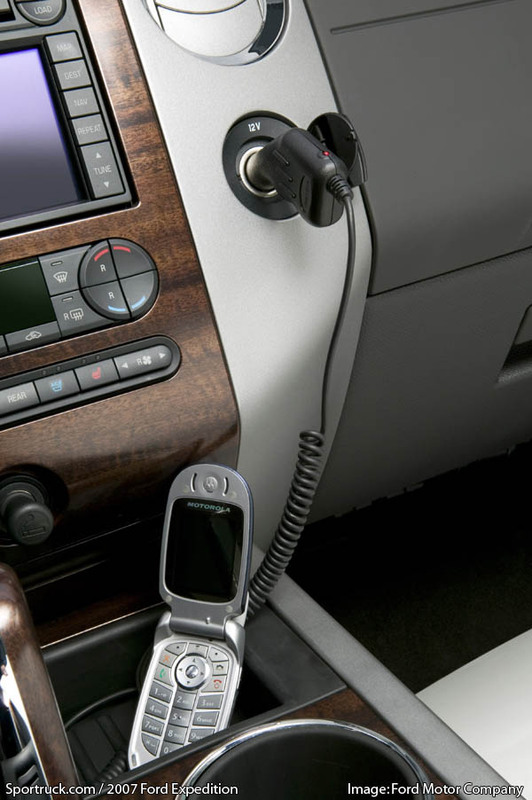 Convenient power point allows for easy cell phone recharging. 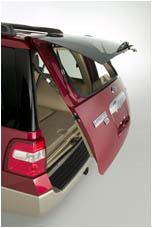 Expedition now offers a power lift gate. Also shown is the separate lift window. The available family-entertainment DVD system features an 8-inch flat panel display and two sets of wireless headphones. 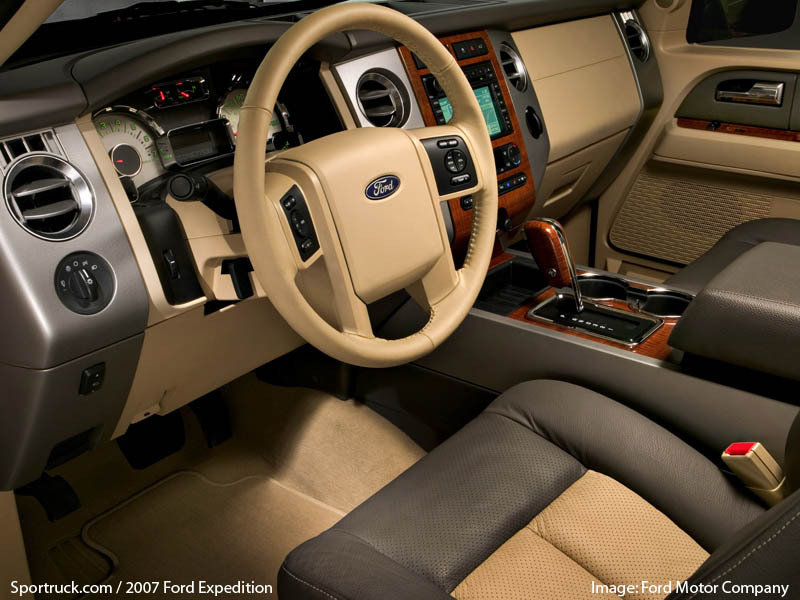 The console shifter adds to Expedition's sporty and modern image. Sharply-styled running boards offer easy entry and exit. 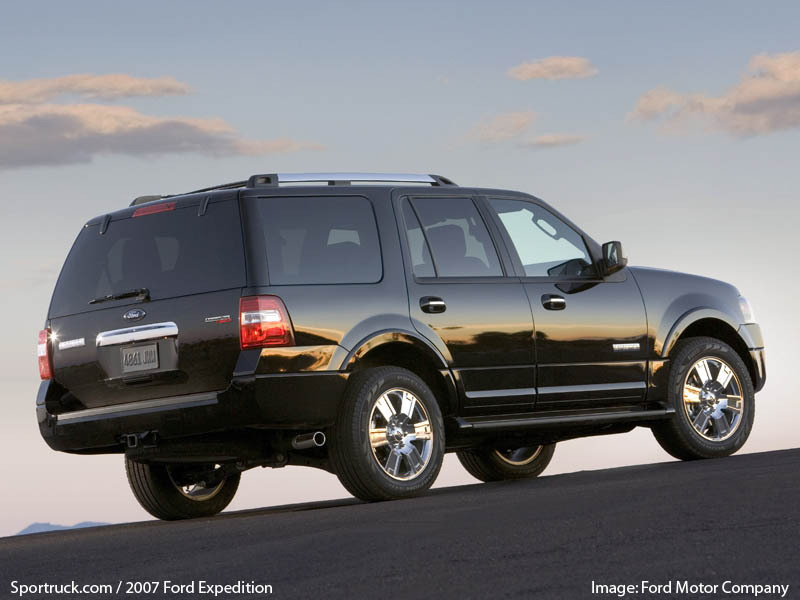 Expedition’s new design, inspired by the Ford F-Series truck, signals big improvements in capability and functionality. 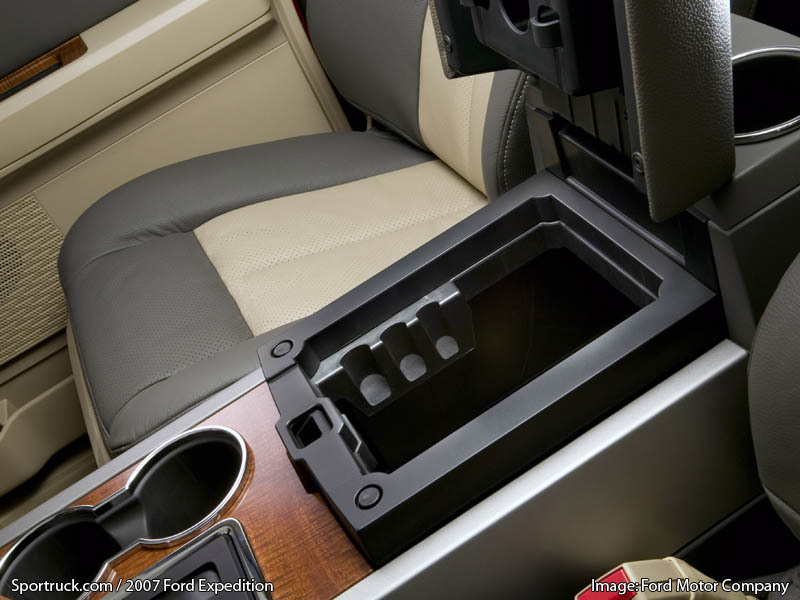 And new levels of interior refinement, flexibility and quietness change the game in Expedition’s favor among discriminating full-size SUV customers. 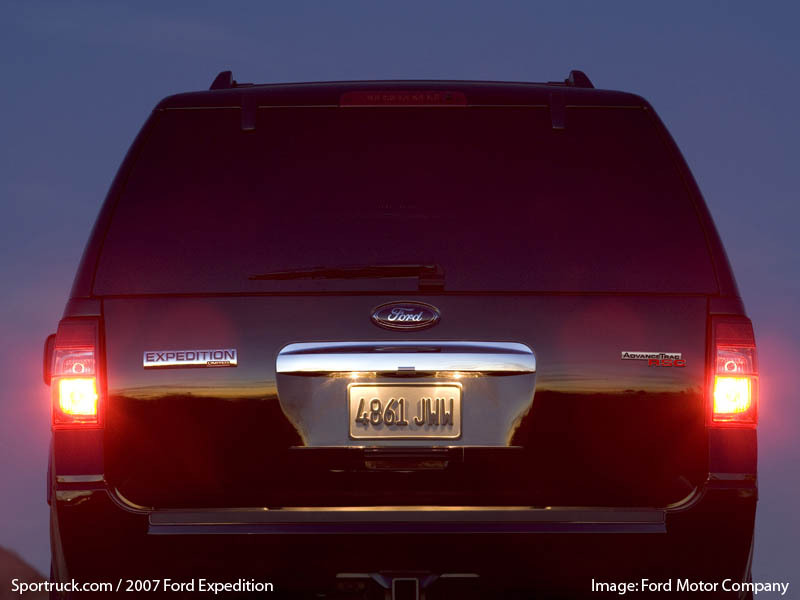 The Ford Expedition now comes in two sizes for 2007 regular and EL (extended length) offering full-size SUV purchasers increased choice. 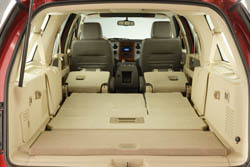 The EL adds 14.8 inches of additional overall length, and a total of 130.8 cubic feet of cargo space including 24 cubic feet more behind the third-row seat than the standard Expedition. 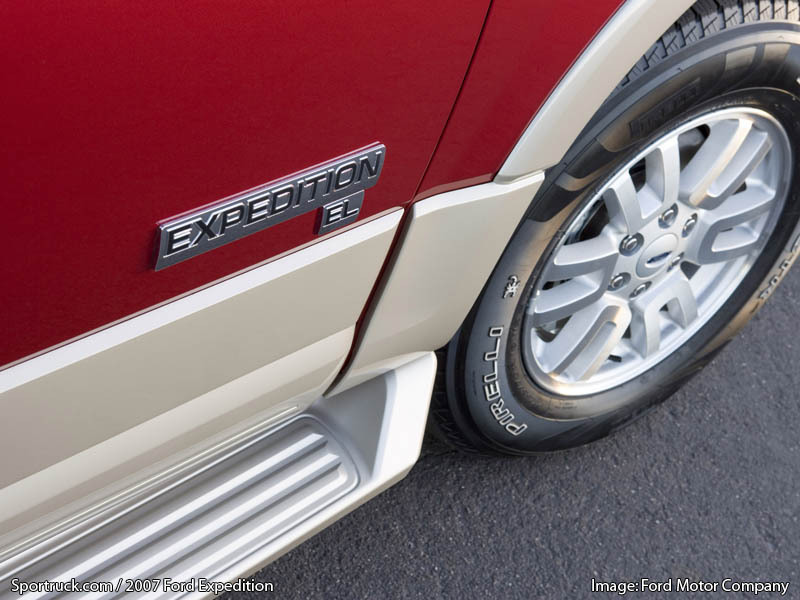 Expedition EL rides on a 131-inch wheelbase 12 inches longer than the standard Expedition. 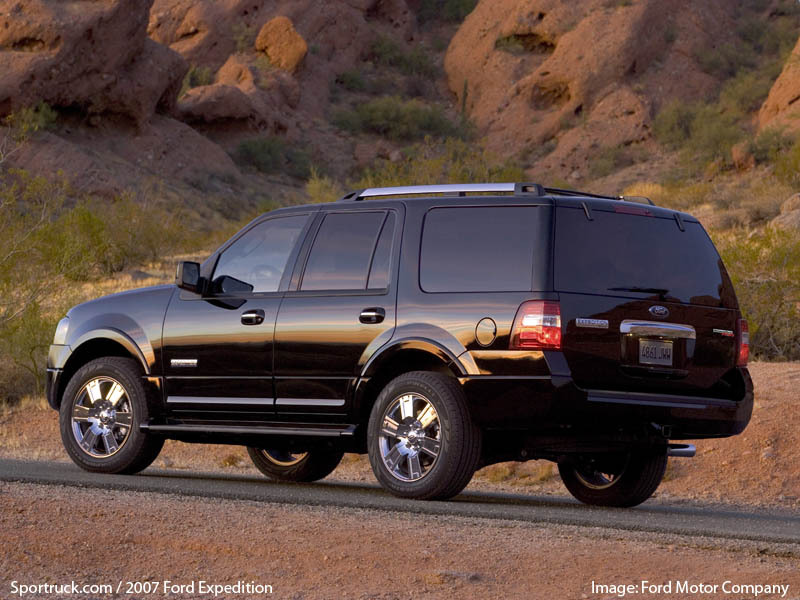 Expedition EL is unique from the B-pillar back with its own floor pan, one-piece body side, running boards, rear fascia, roof rack, rear quarter glass, one-piece headliner and quarter panel trim. The second-row doors are also unique to improve the entry and exit for both second and third row passengers. 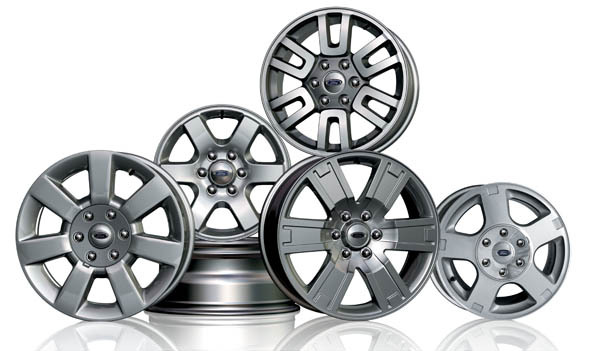 Expedition offers five different wheel styles, ranging from 17 to 20 inches in size, giving customers more customizable options. 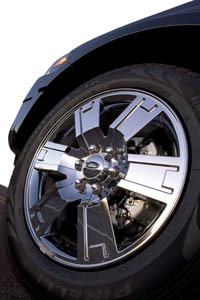 The largest 20-inch chrome-clad, six-spoke wheels wear generously-sized 275/55R20 all-season tires. 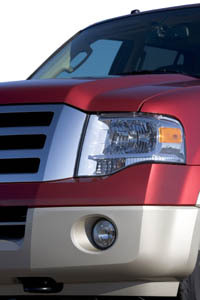 Expedition’s prominent grille serves as the focal point for the raised powerdome hood. New dual-beam headlamps feature the Ford-themed step-up design with the integrated side-marker lights wrapping around into the front fenders. 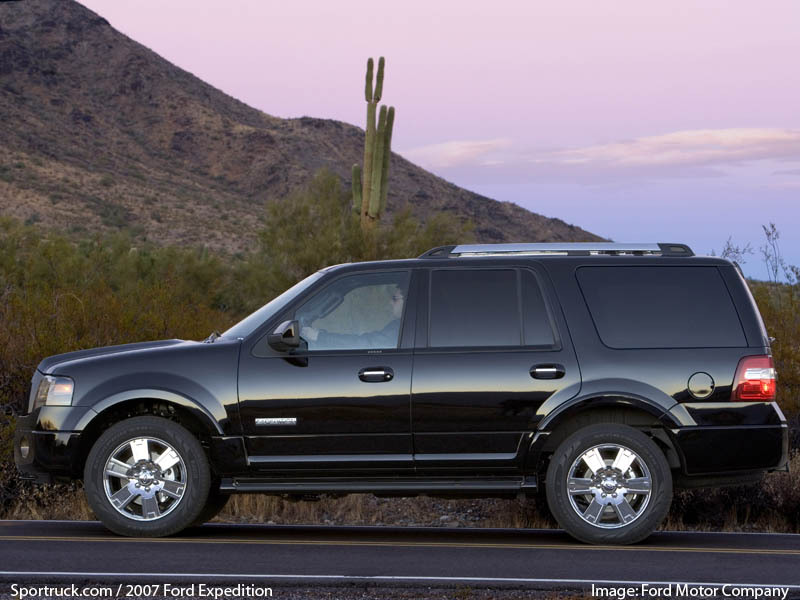 Smooth sides and large wheel lips further define Expedition’s stance and frame its large wheels and tires. 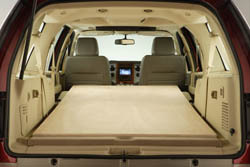 Inside, the 2007 Expedition delivers a new level of comfort. The seats have been redesigned from the floor up with improved contours, larger bolsters, softer cushions and upgraded materials to provide increased comfort on long trips. 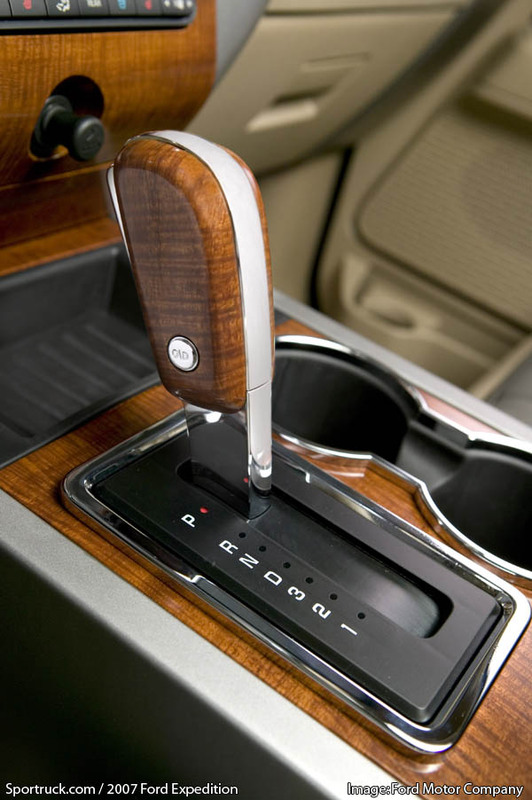 The new console-mounted gear shifter has wood finish matching the steering wheel, door panels and console. Each trim level features a distinct look. 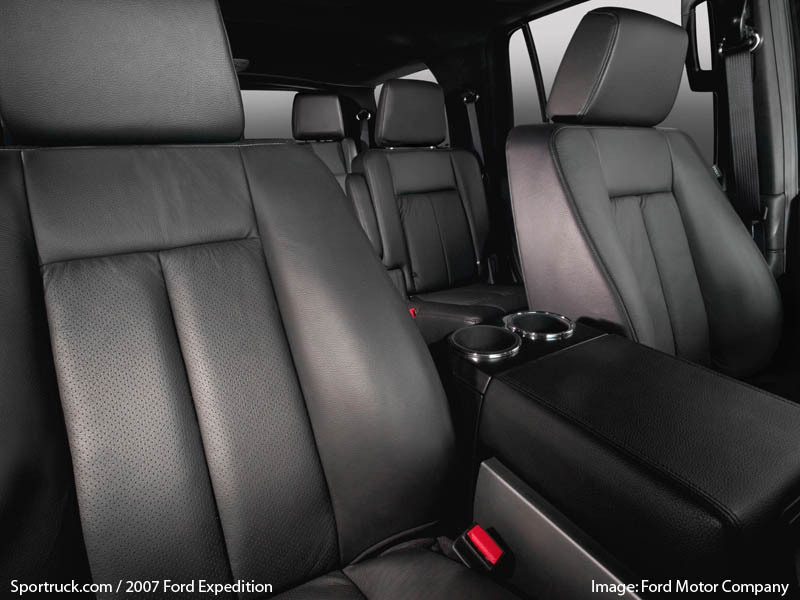 The Expedition XLT uses a gray dashboard, embossed cloth seat inserts and warm steel trim. Two Eddie Bauer options combine rich, warm-gray first- and second-row leather-trimmed seats with a choice of camel or stone accents. Expedition Limited is a statement in monochromatic rich gray or charcoal black luxury. 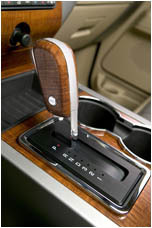 Available caramel-colored leather seat inserts bring out the richness of the mahogany wood accents. Heated and cooled front seats are available. Expedition’s seating also is more capable. The driver’s seat’s rearward track travel was increased by nearly an inch to accommodate drivers from 4 feet, 11 inches up to 6 feet, 4 inches. Expedition XLT features six-way power-adjustable front seats, with a 10-way-power driver’s seat standard on all models with leather trim. Expedition EL's flexible interior offers seating for up to eight One-lever action, kneel-down, 40/20/40-split second-row seats fold flat with the load floor to offer extra cargo space and easy third-row access. 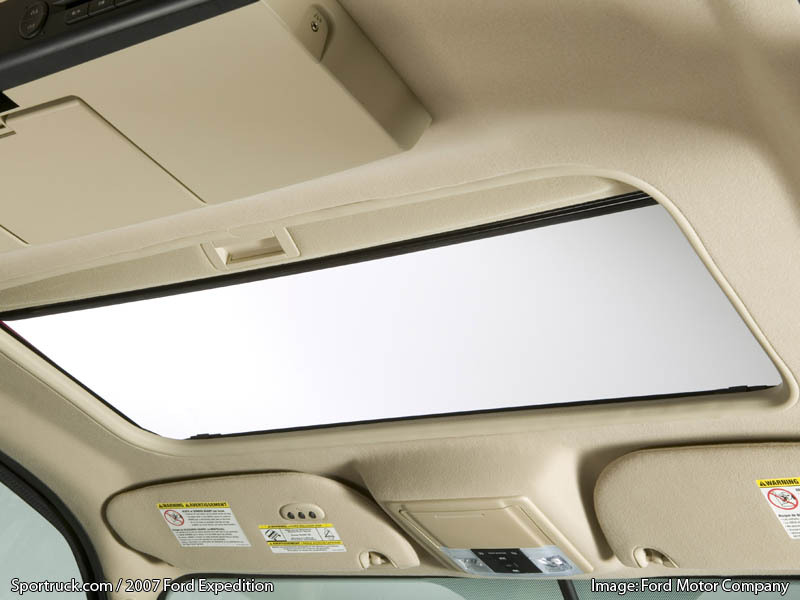 A sliding center section can be moved forward up to 11 inches to give the front-seat passenger easy access to a young child. The second row is available in this 40/20/40 bench configuration, or with two captain’s chairs and a walk-through center passage. The available 60/40-split third-row seats are designed to accommodate passengers as tall as 6 feet, 2 inches. The seat folds flat into the load floor, providing easily accessible cargo space without the inconvenience of removing the rear seat. For the ultimate in convenience, Expedition buyers can choose the optional power third-row seat that folds flat with the touch of a button. For 2007, the power-folding rear seat features a faster and more fluid folding action. 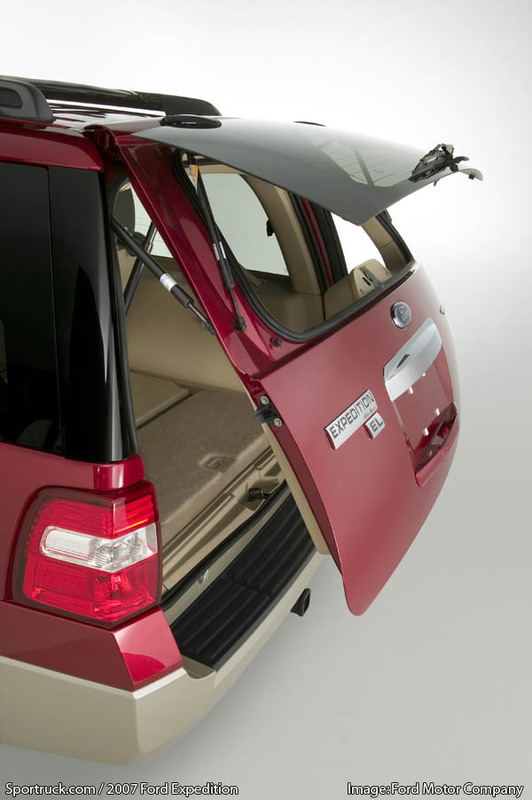 A new power liftgate is designed with the lift mechanism moved off to the side and out of the driver’s rear view. A new climate control system utilizes a new scroll compressor and larger air ducts and vents for improved airflow. This increased capability will warm the cabin and defrost windows in two-thirds the time of the previous model’s system. Additional attention has been given to reduce noise and vibration. Improved sound-deadening materials in the carpet and headliner, increased insulation behind the dashboard and door panels, thicker side glass and a specially engineered roof panel that doesn’t move as much help to reduce interior noise. Bigger, softer body mounts and improved engine and transmission mounts isolate the cabin from unwanted vibration. Wind tunnel-tuned-and-tested outside mirrors further reduce wind and road noise. 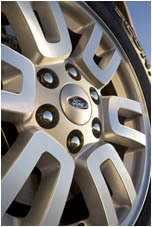 Even Expedition’s tires have been specifically tuned to reduce road noise. 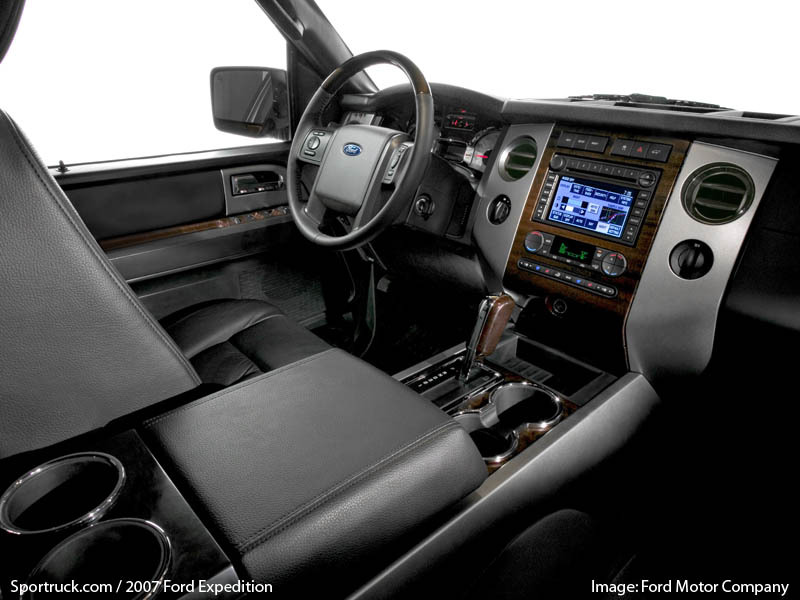 Completing the inside upgrades, the Expedition offers a variety of electronics and entertainment. A DVD-based navigation system covers the United States, including Alaska and Hawaii, and is controlled by a 6.5-inch color touch screen, voice activation and speaks the upcoming street names and intersections in three languages. The available entertainment DVD system features a large 8-inch flat-panel display. 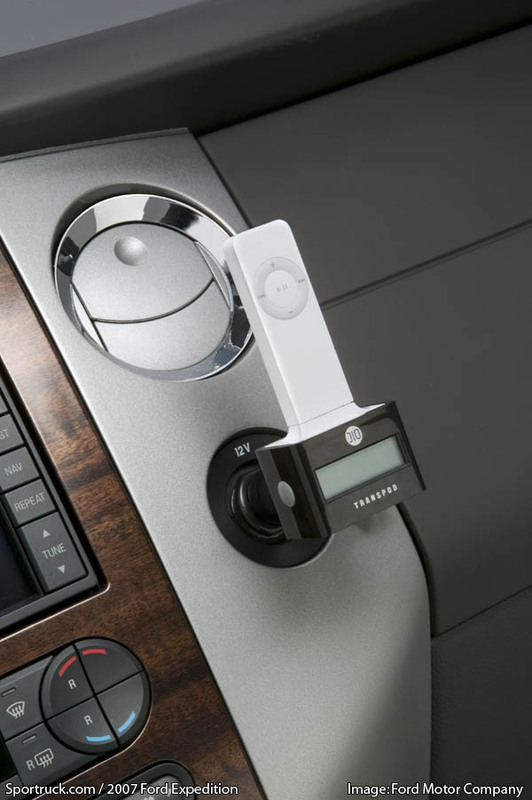 An available 340-watt AM/FM audio system is MP3 capable and features an in-dash six-CD changer with six premium speakers, plus a subwoofer. 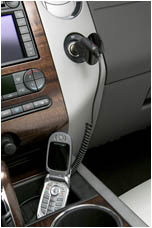 Expedition comes standard with an audio input jack with plug-and-play iPod capability. 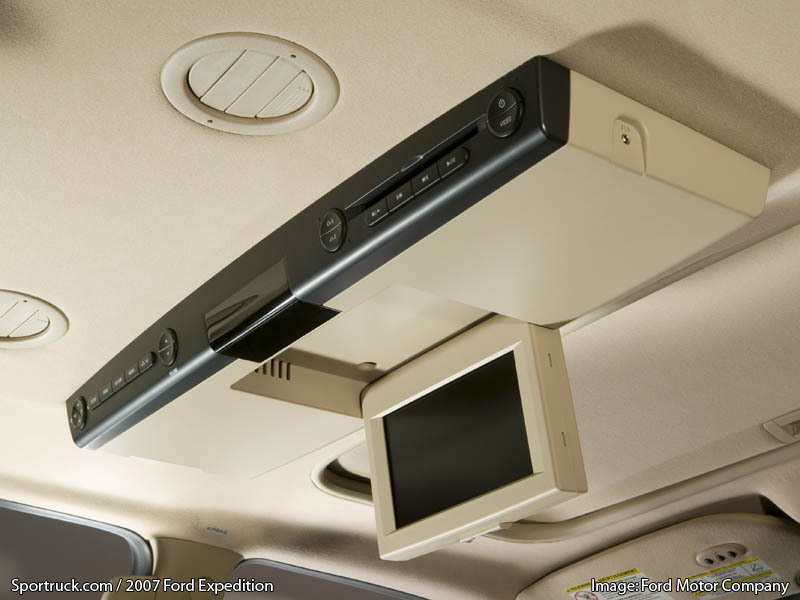 Expedition owners may also choose factory-installed SIRIUS satellite radio. 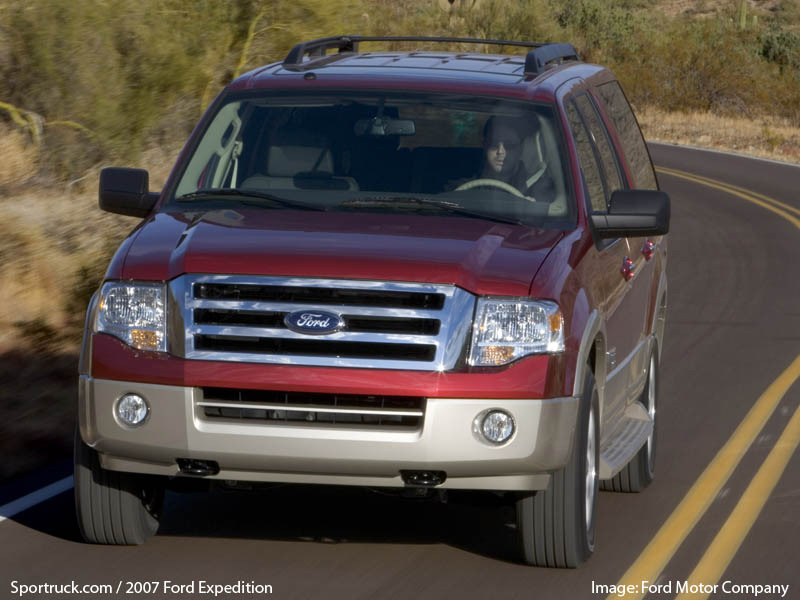 Underneath the 2007 Expedition is even stronger and tougher chassis than its predecessor. The new chassis has revised front geometry and increased box section thickness to provide a 10 percent improvement in torsional rigidity and bending stiffness over the previous model. The new Expedition’s chassis features an all-new front suspension, front frame section and modular front-end construction for ease of assembly and improved quality. Ford’s patented porthole-through-frame design allows the drive shafts to feed through the frame rails, lowering the center of gravity for better ride and handling and maximizing passenger space in the third-row seat. 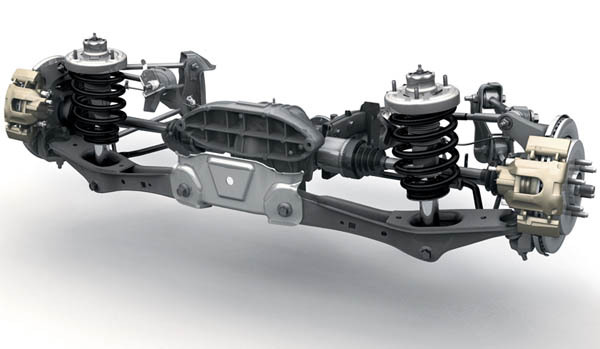 The new independent rear suspension features a five-link design for better control of fore/aft and lateral load forces. Monotube shocks on all four corners allow for more precise tuning and a better ride. 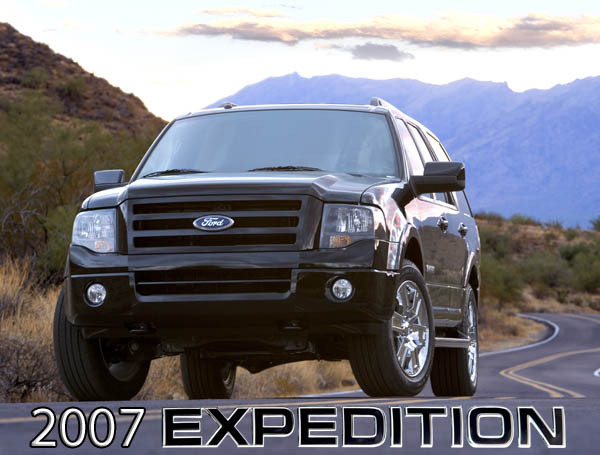 Expedition’s second-generation IRS improves upon the segment-leading system introduced in the 2003 Expedition. 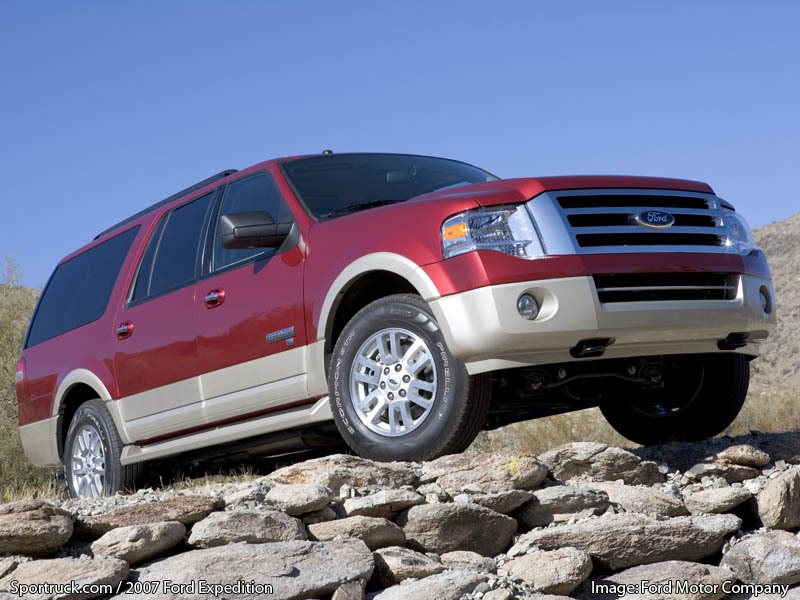 Expedition is powered by Ford’s tough truck-proven 5.4-liter Triton V-8 engine. With single overhead cams, three valves per cylinder and variable cam timing, the 5.4-liter engine delivers 300 horsepower and 365 foot-pounds of torque, and can tow up to 9,100 pounds. The engine is controlled by a 6-speed automatic transmission with manual shift capability, and its wide 6.04:1 gear ratio and two overdrive gears deliver improved performance and fuel economy over the 4-speed it replaces. 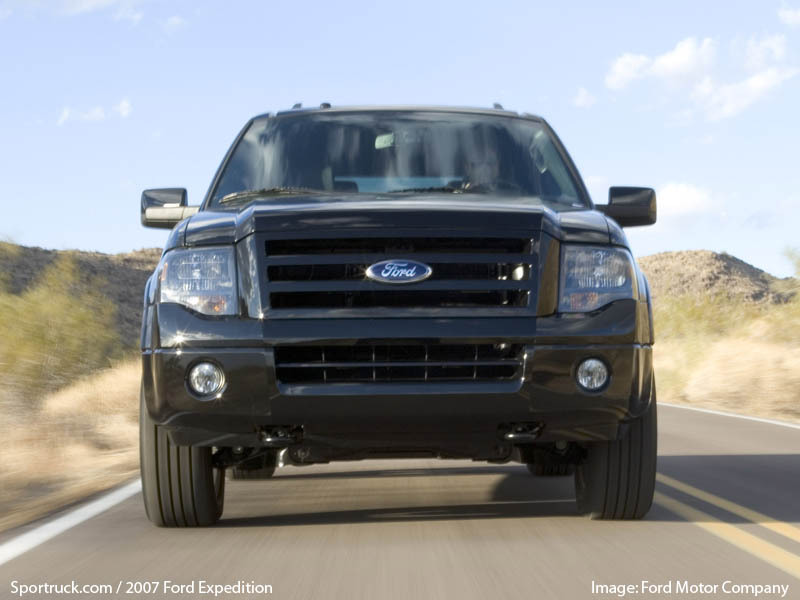 AdvanceTrac with RSC (Roll Stability Control) is standard on both Expedition and Expedition EL. Ford’s system utilizes a gyroscopic roll rate sensor to accurately measure the vehicle’s yaw and roll angles. If the roll rate sensor detects a significant roll angle, the system applies additional countermeasures such as applying brakes to one or more wheels or reducing engine power to help the driver maintain control. The system has 82 active patents and 197 pending patents. Today, the landscape of the utility vehicle market in America is changing. Large traditional utility vehicle sales have declined from a peak of more than 1 million units in 2003 to a bit more than 800,000 in 2005. Ford anticipates the market of large SUVs will continue to decline through the rest of the decade before stabilizing at around 650,000 units. 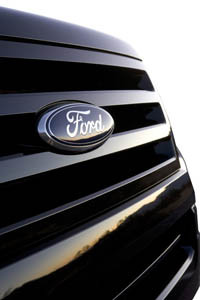 Given the shrinking market, Ford is working hard to meet all customer demands. 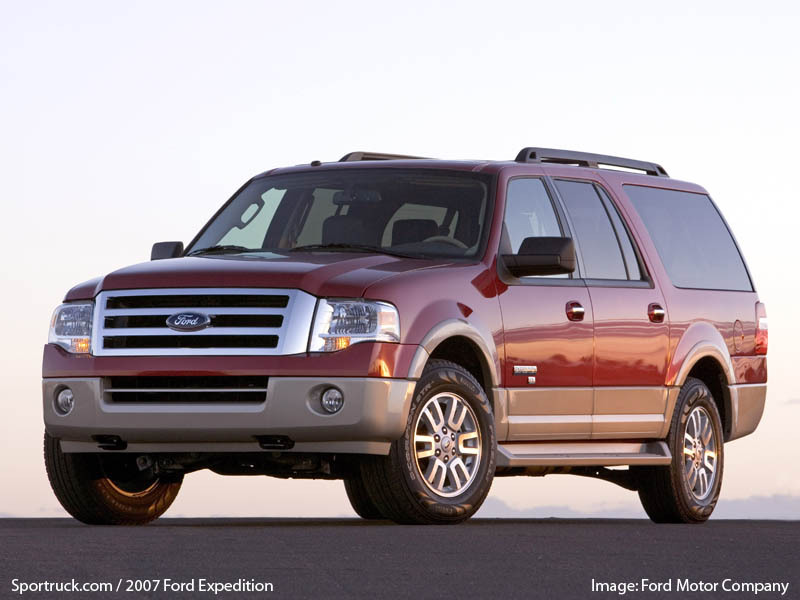 The new 2007 Ford Expedition and Expedition EL will be on sale of Fall of 2006. Pricing will be announced closer to launch. Maximum towing capacity: 9,100 lbs.